Here’s another thrifty DIY project that would make a nice gift. It can be as fancy or as simple as you want it. You can attach feet or not Sew a custom pillowcase or just wrap an old, washed pillow in a sweater, bathmat, or blanket. Remove the “top” of the suitcase or leave it in place and make the bed more portable. You do need to ensure the lid won’t slam shut trapping your pet or injuring them. Here are four tutorials to inspire you. 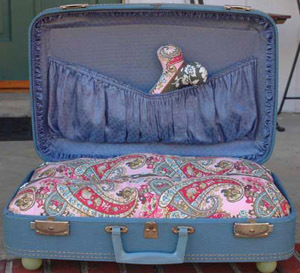 A strap attached to the “top” and the underside of a hardsided suitcase keeps the lid open in the DesignSponge suitcase bed tutorial. 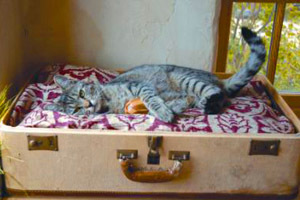 The ReadyMade bed tutorial uses an old suitcase with a soft, flexible top folded under. JewelFaerie’s bed tutorial uses a hardsided suitcase and used a hook & eye to attach the “top” to a wall to keep the lid open. 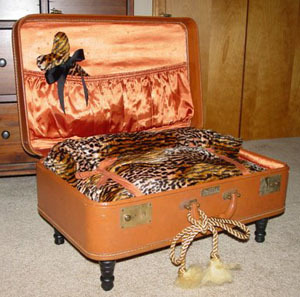 An old, hardsided suitcase with the “top” removed is used in the Natural Home suitcase bed tutorial. A hat case works great for a little dog. This is super cute – I especially love the round bed, and the suitcase with mini furniture legs. I would love to make one of these for my terrier. I’m keeping my eye out for cool suitcases from now on. Finally, a project that takes advantage of a cat’s natural instinct to sleep in suitcases! i keep imagining a doberman in this and it is funnier each time. just wanted to share the mental image with you all. This is perfect for my cat because she LOVES boxes! OMG Love It! Never can pack the darn suitcase without the tossing the cat out of it at least 3 times! Perfect idea for a cat bed! I THINK THIS IS THE MOST AWSEM THING INVENTED. I AM GOING TO TRY IT. FIRST I HAVE TO FIND A SUITCASE. I’m going to give them a try. These are really cute. You can pick up nice suitcases at the Goodwill or resale shops really cheap. This is really cute, especially the one with the legs. Great idea. These are really cute. Great ideas. 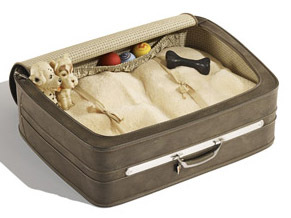 nice concept… but how about the odor… doesn’t the dog’s odor stick to the suitcase’s linings? I don’t think you’re supposed to use the suitcase for anything else, again. And you would use washable bedding, if that is a concern. I love this! 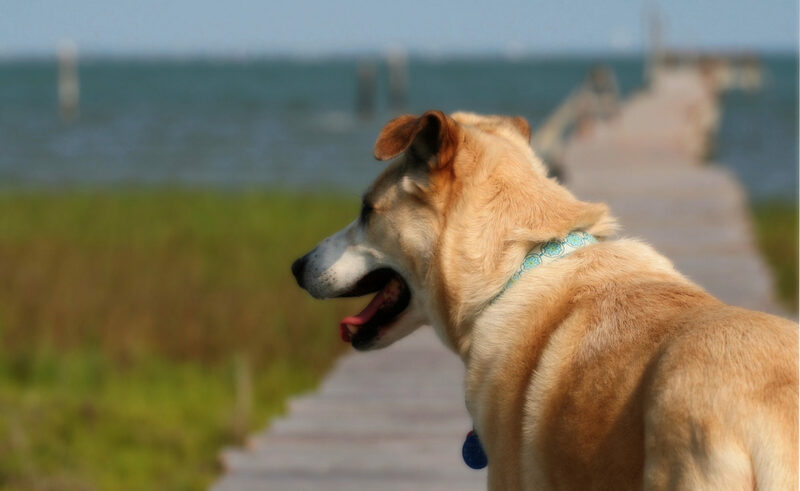 I am going to re-post on my blog…you should install the “Share This” button so this idea can be spread around! These are too cute! What a great idea. It’s definetly a great way to reuse something that would just go waste otherwise. I found some other neat things that were turned into pet beds on this website called guffly. They have things like sails and stuff. Pretty neat what you can do with old stuff!! Thanks for the idea! I love it! so cute! thanks. Wow great idea, i know what me and my daughter will be doing tonigh….. making cat beds!! What a clever idea! I bet the Goodwill or similar store would have hard-sided luggage. Great imagination. They definitely look good. I’ll do that while saving money to buy Chowder another dog bed. Very clever. I’ve had an old suitcase lying around for years that I just couldn’t bear to part with. Now I’ve got a new dog bed idea! What a super idea! Every time I get ready to pack my suitcase for a trip the cat gets in it like he wants to go too. 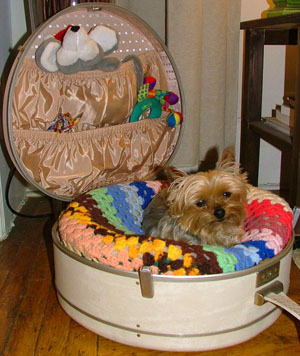 I bet he would love a suitcase bed! Great Idea to make pet beds. 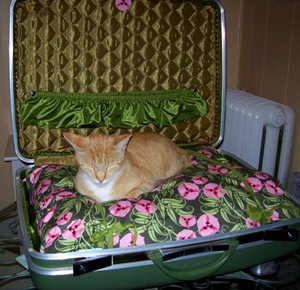 I have a few old suitcases that I would like to convert for my dog Annie and my cat Fluffy. Love this idea! Would love to find the perfect suitcase to do it with.